Day 1 : Arrival Delhi, Guided City Tour, Overnight Delhi . Day 2 : Train To Chandigarh . Explanation of the bikes and time to get used to your new vehicle. Short drive to Shimla. Overnight Shimla. Day 3 : Drive to Mandi. Overnight Mandi. Day 4 : Drive through the beautiful Kulu valey to Manali. Overnight Manali. Day 5 : Day at leisure in Manali. Day 6 : Drive to Jispa across the first pass, the Rhotang La at 3978m. Overnight in tents at Jispa. Day 7 : Drive across the Tibetan Plateau to Sarchu. Crossing of the Baralacha-La pass (4883m). Overnigh at tentcamp in Jispa. Day 8 : Drive to Tsokar, country of the "Khampa" Nomads. Crossing of the Lachlung La (5050m). Overnight in tents at Tsokar. Day 10 : Drive to Chomathang. Final and unforgetable dinner prepared by our staff. Overnight in tents at Chomathang. Day 11 : Drive to Leh. Visit Hemis and Thiksey monastries. Check in hotel and enjoy the rest and comfort of a hotel. Overnight in Leh. Day 12 : Day at leisure in Leh. Overnight in Leh. 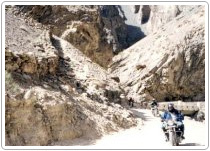 Day 13 : Drive to the Khardung La Pass, the highest motorable road in the world 5621m. Overnight in Leh. Day 14 : Flight to Delhi.